jensen and eric k. . Wallpaper and background images in the Jensen Ackles club tagged: jensen ackles jensen ackles 2011. This Jensen Ackles photo might contain eis am stiel, lutscher, eis lolly, popsicle, and lolly. 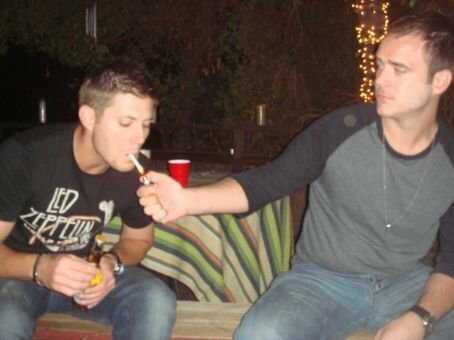 This seems to be the only pic people can find of him smoking, so maybe its just a one time thing? Doesn't look like a "regular" ciggie - like he isn't chilled enough already :-)!! !